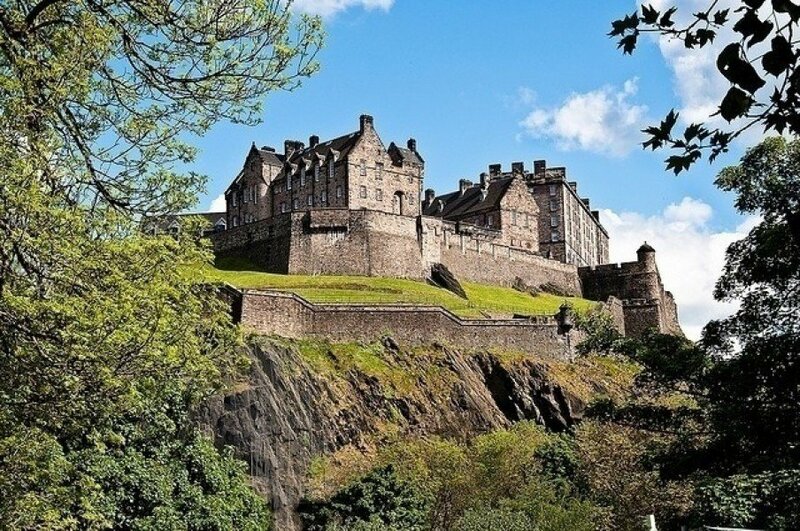 Edinburgh Castle is the the best rated tourist attraction in Great Britain and Northern Ireland. 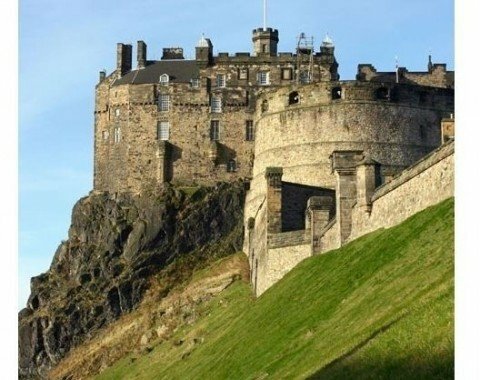 When it comes to the fabulous architecture of Edinburgh, the impressive Edinburgh Castle is the icing on the cake, situated on Castle Rock. If you ever make it to Scotland, this particular castle is a must see! Walking all the way up here is definitely worth for, firstly, visiting the marvellous castle and, secondly, the view that you may enjoy standing up here is just stunning. From the castle you have a fantastic view over the entire city. After a stroll through magical Edinburgh, you may want to have a break and relax in cosy cafés, such as The Tea Rooms and Redcoat Café and enjoy a hot cup of finest teas here. Castle Terrace is just the perfect restaurant to have dinner at and enjoy a fine glass of wine or Whisky to round off your day. At the Great Hall you can actually see the medieval wooden roof which is one of the most remarkable ones in entire Britain. Pay attention to the stony heads and symbols on the beams. They show a Green Man and some thistles, Scotland's national symbol. Highly impressive to look at is the weapons and armament collection, including the infamous Lochaber Axe ornamenting the walls. The crown jewels of Scotland are also known as the Honours of Scotland and consist of a crown, state sword and a sceptre. The first time they were used was at the coronation of Queen Mary in 1543. They were then locked up in a chest in the crown room of the palace in 1707 and were only rediscovered 111 years later by Walter Scott. The Stone of Scone, also known as Stone of Destiny, is another impressive feature of the palace, which is incorporated into the coronation chair. Legend has it that this 152 kg heavy sandstone block was originally thought of as biblical relic, depicting the pillow that patriarch Jacob laid his head on when he was dreaming of a stairway to heaven. There is a plant that was named after this allegory: Jacob's ladder. It is said that he came to Ireland this way and was taken by the first Scottish kings to Scotland. The Stone of Scone is only taken out of the crown room on the occasion of a coronation taking place in Westminster Abbey. The 1 o'clock gun has been in use since 1861 almost daily at exactly 1pm. Nowadays, this procedure takes place out of tradition, but originally goes back to the fact that sailors and seafarers were in need for an exact timing in order to be able to adjust their chronometers precisely. Obviously, the tradition is still alive and has remained so for more than 150 years, very much to the taste of all visitors. The shot of the former 18 pound front loader cannon can be heard within a range of 3 km (1.9 mi). In 1953 the cannon was replaced by a modern 25 pound Howitzer gun using an L118 Light Gun to fire. A small museum is accommodated within the castle and presents the entire history of the “lunchtime bang“, as the locals like to call it. Additionally, you get to see the 6 tons heavy Mons Meg, one of the oldest and most impressive siege cannons in Europe. It once was designed to fire 150 kg heavy stone cannonballs reaching a fire range of 3 km (1.9 mi). Mons Meg fired its last shot in 1681 in honour of Jacob II, celebrating his birthday. As joyous the occasion was as pitiful was the irreparable crack of the cannon barrel. Every year, the biggest music festival in Scotland takes place on the Esplanade in front of the castle, the Edinburgh Military Tattoo. As the name already indicates, mainly military music is played, but more conventional dance and singing also meet the approval of the organisers. Apart from the music being played the best thing about the festival is that the profit generated from 217,000 sold tickets each year is donated to charity. The festival took place in August 1950 for the first time and August has ever since been reserved for the infamous Edinburgh Military Tattoo. The programme lasts for one and a half days and has more than 1,000 participants, among which you find the Highland Spring Dancers counting more or less 80 dancers who perform to traditional Scottish music. The Lone Pipers, on the other hand, perform in honour of the fallen British soldiers. The ultimate highlight, though, is the performance by Massed Pipes and Drums, a group consisting of around 200 bag pipe players and drummers who regularly delight the audience with their magnificent performance. At the end of the festival, all participating groups join in together to give their final performance closing the festival singing the British national hymn “God Save the Queen” and the Scottish folk song “Auld Lang Syne”. Goose bumps moment!! Based on its structure, the little chapel is assumed to have been built during the 12th century, most probably by David I, Queen Margaret's fourth son. He had the chapel built in honour of his mother who was known to have been good-natured and benevolent. The oldest still preserved building in Edinburgh fascinates through its simple and elegant Norman style design, equalling continental Europe's Romantic period. In the 16th century, the chapel functioned as storage for gun powder and later became a bombproof place. Sir Daniel Wilson, an antiquarian, turned the building to a fully-fledged church again after a restoration in 1845. Now there are fresh flowers ornamenting the chapel which is taken good care of by the St. Margaret's Chapel guild. 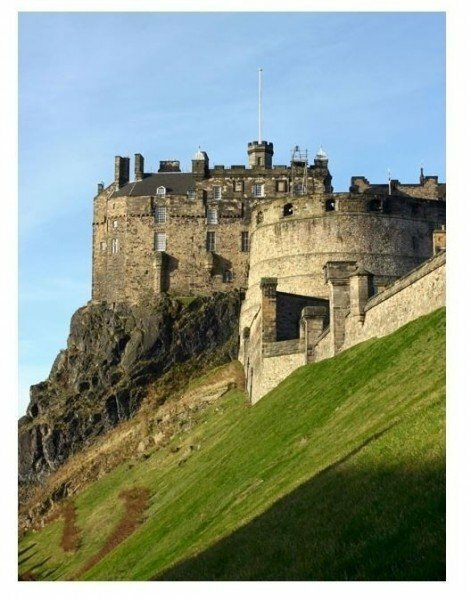 The Castle Rock, which Edinburgh Castle is built on, is actually the basalt cone of a former volcano, which geologists assume to be 340 million years old! The plateau lies 120 m (394 ft) above sea level. Three edges of this boulder fall vertically, making it a very special rock formation destined to be topped by a castle. The rock is comfortably accessible from the east side. Based on archaeological finds, scientists assume that first inhabitants settled on Castle Rock in the 9th century BC already. Up to this day, it remains unknown to us how long the construction process of Edinburgh Castle actually took. There are documents in Welsh writing that reveal the speech of Fortress of Eidyn, dating back to the 7th century. This assumption is controversial among archaeologists and historians. First written record about Edinburgh Castle can be found in the chronicles of Scotland by John of Fordun, being in line with the death of King Malcolm II in 1093. Considering the building stock of St. Margaret's Chapel dating back to the 12th century, this must consequently be true for Edinburgh Castle as well. Even though it remains a mystery to us when exactly the castle was built, it is most certainly known that the castle went through a period of difficulties and permanent threats in the centuries that were to follow. The castle was besieged as many times by English troops as it was freed by Scottish ones again. Those fights left their mark on the castle. In consequence, it had to be renovated and rebuilt each time it was attacked by the English. In 1371, a year the Bruce dynasty ceased to be. The Stewarts took over Scotland again and made Edinburgh Castle one of the most influential castles of its time. 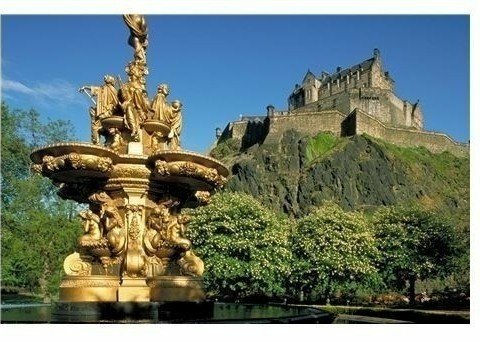 Since 1996 the Stone of Scone has been stored at Edinburgh Castle. On this throne Scottish kings and later even English kings were crowned. Edinburgh Castle is situated in the heart of Scotland's capital, Edinburgh. 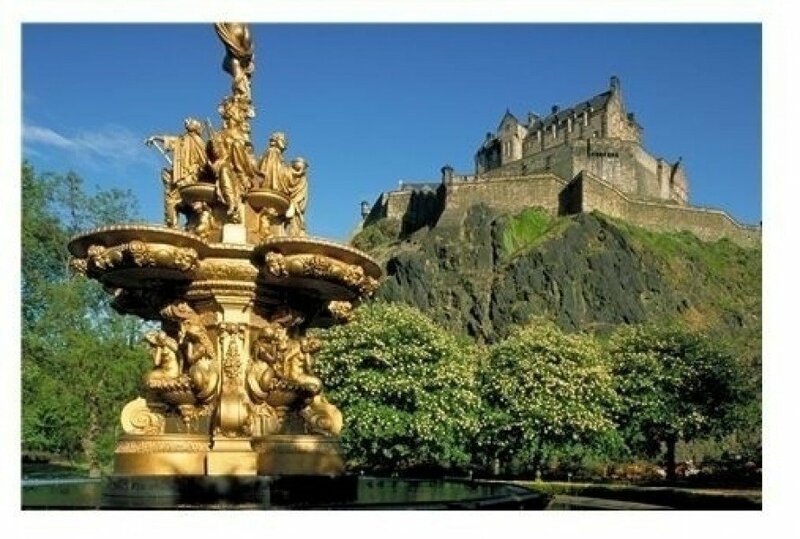 You start your little journey at Edinburgh Airport which is about 12 km (7.5 mi) away from Edinburgh Castle. Follow Eastfield Road, pass the roundabout and keep to the left continuing on Glasgow Road. Follow the road for 8 km (5 mi) and take a right turn into Torphichen Street. Keep to the right where Torphichen Street merges with Dewar Street (B700). Turn left to stay on B700 which then turns to Bread Street. Shortly after you turn left to get on W Port leading to Grassmarket. As soon as you take a turn left the castle will appear just in front of you. There are car parks provided only for people with disabilities/ impairments. The closest possibility to park are at Johnston Terrace and Castle Terrace, the castle's restaurant. Mind that the capacity of free car parks is limited. Waverley Station, Edinburgh's central station, is located at the east end of Princes Street. Walk 500 m (550 yd) down main street North Bridge until you turn right into The Royal Mile at the intersection. From here, then, you may well spot the castle. Airlink 100 is an express shuttle bus service operating between the airport and Edinburgh's city centre. The bus ride takes about 25 minutes heading towards Waverley Bridge, just where you find the central station situated. From here you then continue walking to the castle.